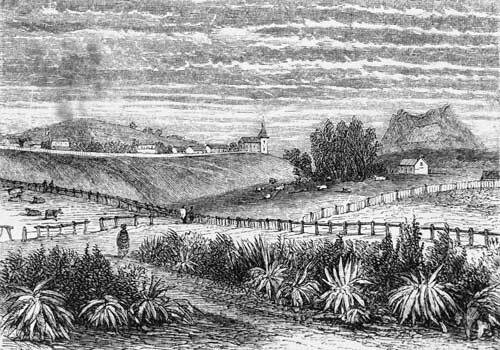 Mission farm The Church Missionary Society mission set up at Waimate, in the inland Bay of Islands, in 1830, included a large farm with sheep, cattle, horses, gardens and orchards. Alexander Turnbull Library Reference: PUBL-0144-1-330 Wood engraving by Cyprian Bridge Permission of the Alexander Turnbull Library must be obtained before any re-use of this image. The special March issue of Environment and Nature in New Zealand contains seven articles – all by graduates of Otago University’s history department (see also: In search of Arcadia?). As the editor’s introduction states, these essays represent the most concentrated research effort in relation to environmental history of any history department in the country, and are well worth a read.